in this revised edition of Granville's "Calculus" the latest and best methods are exhibited,—methods that have stood the test of actual classroom work. Those features of the first edition which contributed so much to its usefulness and popularity have been retained. The introductory matter has been cut down somewhat in order to get down to the real business of the Calculus sooner. As this is designed essentially for a drill book, the pedagogic principle that each result should be made intuitionally as well as analytically evident to the student has been kept constantly in mind. 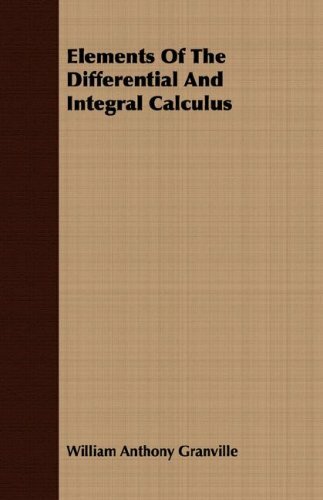 This is a very condensed and simplified version of basic calculus, which is a prerequisite for many courses in Mathematics, Statistics, Engineering, etc. It is not comprehensive, and not intended to be a substitute for a one-year freshman course. by Jerrold E. Marsden, A. Weinstein - Benjamin-Cummings Publishing Co.
A supplement to any calculus text, an alternative treatment of calculus using the method of exhaustion for the derivative and integral in place of limits. The book is for calculus students and instructors interested in trying an alternative to limits.